How does your workload affect your sleep? 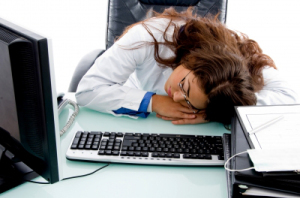 Home » Blog » How does your workload affect your sleep? Does it take you a long time to fall asleep? Feel sleepy and fatigued during the day? You may have a high workload, according to a recent article published in the scientific journal SLEEP. Researchers at the University of Pennsylvania studied 63 adults in a well-controlled ten-day laboratory study. Half of all participants performed computer tasks under a high workload (multiple two-hour work sessions) while the other half had a moderate workload (multiple one-hour sessions). Also, some participants were only allowed 4 hours in bed for sleep each night, for five nights in a row, while others received 8 hours in bed each night. Participants performing under high workload felt sleepier and more fatigued than did those with moderate workload, and this was true both for those receiving 8 hours in bed each night as well as those allotted a mere 5 hours. That is, regardless of how much sleep participants had gotten, high workload made them feel sleepier and more fatigued. Additionally, those experiencing high workload took longer to fall asleep, and again this was true for both the sleep restriction and the sleep rested group. There was a silver lining, though. Once they fell asleep those experiencing high workload slept more deeply and experienced less waking in the night.